50-inches of big screen entertainment doesn't come much more impressive. With even Panasonic's entry level plasmas receiving rave reviews right now, it's hard not to be excited by the arrival of Panasonic's latest plasma flagship. So here's hoping the all-singing, all-dancing, range-topping, and really rather large, 50in TH-50PX600B doesn't let us down. Aesthetically the 50PX600B's appeal depends largely on how it's mounted. With a normal desktop or wall mount it looks a touch ordinary in its mixture of black and rather plasticky grey. Pop it on Panny's floorstand option, though, and its looks come to life as the stand dramatically emphasises the screen's slimness. As befits a flagship TV, the 50PX600's connections include two HDMI jacks - and both of these are compatible with the so-called 'HDAVI' system, developed to allow enhanced communication between the TV and other Panasonic gear such as the latest range of DIGA digital recorders. Other significant connection discoveries include a PC input; a fascia-mounted SD card slot for playing JPEGs and MPEG4 movies, or recording TV programmes in MPEG4; component video inputs for analogue HD sources like the Xbox 360; and a CI slot so you can add subscription services to the TV's digital channel roster. Did we say digital tuner there? Sure did. And given Panasonic's long history of support for integrated Freeview reception, it comes as no surprise that the digital tuner enjoys all the 'support' facilities - including a seven-day EPG with direct timer event setting - that we now increasingly expect as standard. The 50PX600's features list is so long, though, that the digital tuner accounts for an unusually small proportion of the TV's appeal. The most significant thing about the 50PX600 is actually its V-Real video processing engine. Panasonic reckons this is a quantum leap forward from its previous technology, and as usual with such systems, it's an umbrella term for a plethora of improvements. Keeping things as simple as possible, these include: Digital Remastering for adding more fine detail information to standard-definition sources; sub-pixel control, which separates out the red, green and blue colour components of each and every pixel so that it can process them more cleanly; handling of 720p and 1,080i HD sources in their native form; and improved gamma controls that, it's claimed, permit 3,072 steps of colour and greyscale gradation. This latter V-Real element together with new 11.5-bit video processing enables Panasonic to claim a huge palette for the 50PX600 of 29 billion colours. Other specifications of interest include an outstanding (and probably optimistic) claimed contrast ratio of 10,000:1, and a native resolution of 1,366 x 768. This resolution means the 50PX600 isn't one of the new 'true HD' 1,080-line fl at TVs that are starting to appear. Before we finally find out how the 50PX600 performs, it's worth quickly clarifying what makes the PX600s different to Panny's PX60 range. It comes down to three key extra features on the PX600: the SD card slot, mentioned earlier; full picture-in-picture tools; and an improved speaker design that Panny claims improves bass, clarity and power handling. Almost boringly, we have to report that the 50PX600's pictures, while not flawless, are certainly never less than extremely good. 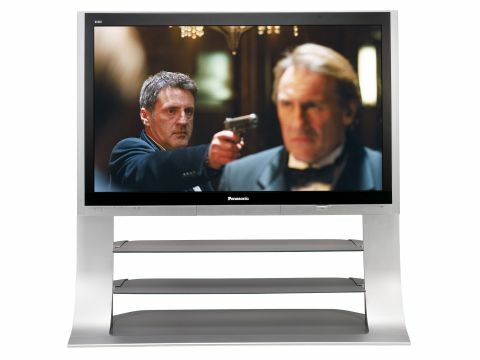 Particularly striking, as ever with Panasonic plasmas, is the profundity and naturalism of the 50PX600's black levels. No big LCD TV has yet got close to the sort of greyness-free blackness seen in dark movie corners on this screen - and actually, we can't think of any 50in plasma that's managed quite such a fully realised black level, either. It's not just the depth of the black levels that catches the eye, for somehow that depth is achieved without forcing into hiding the sort of subtle greyscale gradations and shadow details that really bring dark scenes to life. Another big tick in the plus column is earned by the freedom of the 50PX600's pictures from pretty much all video noise. So there's practically no sign of plasma's issues with fizzing over horizontal motion, colour striping, or dotting in dark areas. Moving objects look crisp and free of blur, too. What's more, we're not just talking here about high definition pictures. Sure, it's with HD that the TV really shines, but the quality of the V-Real processing and Panny's image scaling is such that even standard definition finishes up far more polished-looking and watchable than we'd expect. The impressively natural flavour introduced by the image's noiselessness is enhanced by the 50PX600's colours, which are more believable in tone than any we've seen in the LCD world, and most we've seen in the plasma world. We do, however, have a cluster of minor complaints. For starters, standard and high-definition pictures alike don't look quite as crisp and textured as we've seen them on a few (especially LCD) rivals - possibly because the V-Real processing places more emphasis on keeping pictures free of noise than on adding extra fine detail. Next, colours, although extremely natural and subtly toned, aren't quite as vibrant as with some rival flat panels. And finally, if you watch from the side, you can sometimes make out a slightly offset secondary image caused by the two separate layers of glass that make up the screen. While these niggles try to undermine the 50PX600's strengths, they ultimately fail, leaving you with as fine a picture as the affordable 50in TV world has to offer (excluding Pioneer's £6k PDP- 5000EX from this category). The 50PX600's audio is no slouch, either. The fancy speakers introduced for the PX600 range are remarkable in terms of both their power and their precision, combining vast volume potential with lots of subtle treble detail, oodles of well-rounded, deep bass, and authentic dialogue.